Tax returns, that is. Get free, friendly help preparing your taxes at HCPL. Longtime partner, AARP Tax Aide, has opened up shop at eleven Harris County Public Library branches. See More for locations, days, times and document checklist. Help the Library better serve you! January isn't just a time for people to try to figure out what they can do better. Libraries like to do it too! Help us to better serve you this year by letting us know what your favorite programs of the year were. On our list below are some of our best attended programs of 2018. Let us know what you loved, and if there are other programs we did that you liked, let us know by writing them in! We'll try to take that information to do more of what our community loved as we plan our programs this year. We've still got free tax help available if you're someone who still needs to file your taxes. 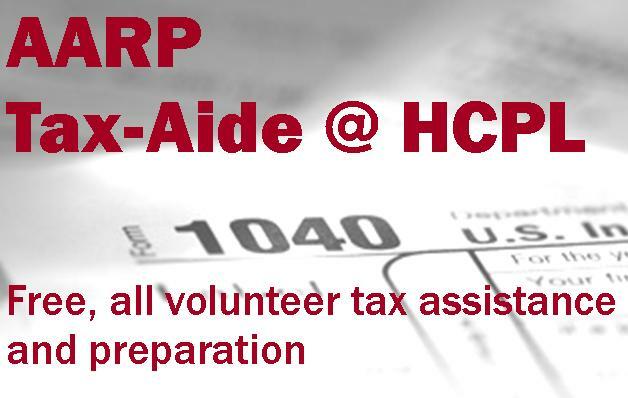 The AARP tax preparers are here to provide free tax assistance for the elderly and low income individuals. Come by Mondays or Fridays from 10 AM - 2 PM through Monday, April 16, 2018. Other HCPL locations are available with different times. For more information about these locations or what to bring with you, please call the library at 281-492-8592. You can also find more information here. Looking for Help with Filing Taxes? AARP volunteers will be there on Saturdays from 10am-4pm and Mondays from 1pm-8pm. This is a free, first come-first served service. For a list of other HCPL locations offering this service and their hours, please check the HCPL Tax Schedule. every Tuesday through April 17th from 11 to 3. Sign-Up starts NO earlier than 10A.M. INSIDE of the library on that Tuesday. The church is located at 22800 Aldine Westfield Rd Spring, TX 77373 right across from the Cypress Trails United Methodist Church. The service for this area will start on Saturday February 3rd from 10 am to 2 pm. It is a free service, and it will be first come first serve. No appointments will be necessary.